﻿ News Bharati - Gujarat Summit vibrant enough, attracting heavy investments for state development..! News Bharati - Gujarat Summit vibrant enough, attracting heavy investments for state development..! Gujarat Summit vibrant enough, attracting heavy investments for state development..! 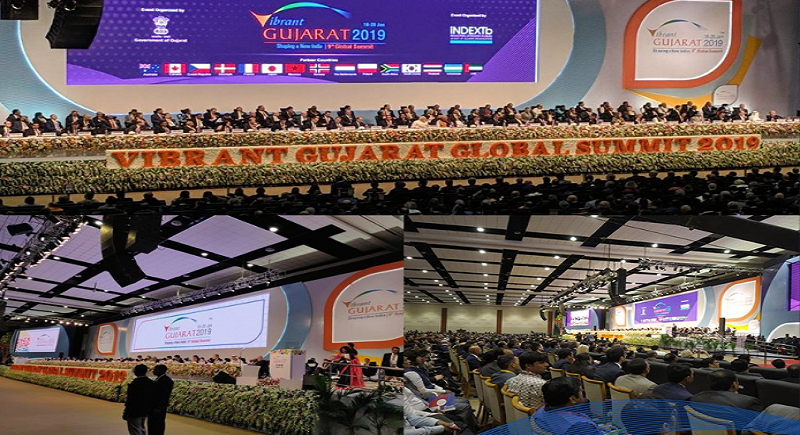 Gandhinagar, January 18: Aligning to the second day of his visit in Gujarat, PM Narendra Modi today inaugurated the 9th edition of the Vibrant Gujarat Summit in Gandhinagar witnessing nearly 1.5 million visitors and more than 30,000 national and international delegates. The summit is set to observe the launch of forums aimed at diversifying the nature of knowledge sharing & intensifying the level of networking between the participants. The Vibrant Gujarat Global Trade Show is being held on a two lakh square metres plot of land situated in Gandhinagar where more than 25 industrial and business sectors will showcase their products at the event. Modi met Prime Minister of Malta Joseph Muscat on the sidelines of Vibrant Gujarat Global Summit followed by his meet with the Uzbekistan President Shavkat Mirziyoyev in Gandhinagar. The two leaders discussed economic linkages and agreed to enhance mutual cooperation in sectors such renewable energy, pharmaceuticals & healthcare, air connectivity and tourism signing a MoU in relation. They also welcomed the signing of the agreement between the Export-Import Bank of India and the Government of the Republic of Uzbekistan on a Line of Credit of USD 200 million supported by the Government of India for financing housing and social infrastructure projects in Uzbekistan. The Line of Credit of USD 200 million to Uzbekistan had been announced earlier by Prime Minister Narendra Modi during the State Visit of President Mirziyoyev. The three day event was attended by international and national business delegates including N Chandrasekaran, chairman of Tata sons, David Farr, chairman of Emerson Electric, Gautam Adani, chairman of Adani group, Kumar Mangalam Birla, chairman of Aditya Birla Group. “It's always been an honour to speak at Vibrant Gujarat and I've been fortunate to attend every summit. This platform has all the defining stamps of our Hon'ble PM’s imagination - towering vision, unprecedented scale and a leading role in reshaping India. Jai Hind!”, said Adani. Meanwhile the Chairman of the Birla Group, said that the Statue of Unity was reason for India's pride. He mentioned how Ultratech Cement, a company under the Aditya Birla Group, had played its part in the construction of the 182-meter statue. Soren Skou, CEO at AP Moller Maesrk, said that India is a key market for their global business, as a fast growing centre of demand for their sophisticated products. “Looking at India to support global operations. We applaud the steps taken to reduce logistics cost”, he lauded. Whereas, Didier Casimiro of Rosneft said, “Vibrant Gujarat has graduated from an investment promotion event to a forum to forge strong relationships. Through our Investment in Vadinar & growing retail network, we're contributing to Hon. PM's vision for India. Looking to invest $850Mn in India”. Adani at the event has announced a 55,000-crore investment in the state while Mukesh Ambani has pledged Rs 150 crore for Pandit Deendayal Petroleum University in Gandhinagar. Kumar Mangalam Birla has promised an investment of Rs 15,000 crore in Gujarat. The trade show will continue till January 22 and will be open for general public on the last two days, being January 21 and 22.